Alabama’s seafood scene is an impressive one. Crab is a fan favorite in this state, and for good reason: there are tons of places serving up tasty fresh crab dishes that just can’t be beat. You won’t regret a meal at these 10 best places for crab in Alabama. Though far from Alabama’s golden shoreline, this unique seafood restaurant rivals those you’d find at the beach. Their menu is chock full of crab entrees, including blue crab claws, crab cakes, stuffed deviled crab, soft shell crab, and Alaskan snow crab legs. Bring your appetite—portions can be quite large. The menu here leaves no appetite unsated, especially since they’re offering plenty from both land and sea. 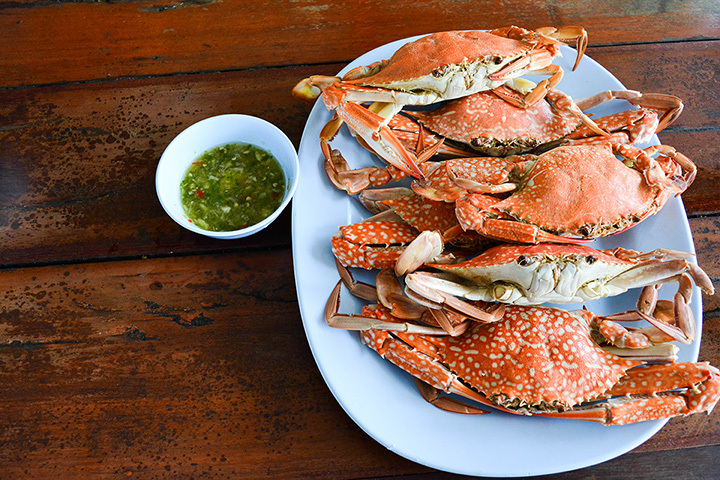 Their crab claws are a favorite among locals, giving you the choice of fried, steamed, grilled, or blackened. Whichever way you choose, you can’t go wrong! This is the crab lover’s paradise, offering you this classic entree in more than one way. Snow crab, crab cakes, crab-stuffed shrimp, and blue crab claws will leave you wanting for nothing. It’s the best place for steamed seafood on Alabama’s coast, hands down. This four-location restaurant is one of Alabama’s favorite spots for catfish, but their crab dishes are also not to be missed. Their crab claw dinners are a huge hit. Being a family-owned restaurant, you can also expect a side of southern hospitality with every visit. Alaskan king crab really is king around here, and you can pair it with their seafood tower to get all the best flavors of the sea in a single sitting. As an added bonus, they also offer crab on their sushi bar and as a tasty crab and cauliflower arancini appetizer. Make sure you save room for dessert—it will be hard to choose just one! This all-star menu is packed with seafood and land-loving favorites, but the crab options are sure to please. Snow crab legs are a tried and true favorite, but you’ll also want to try the blue crab claws, southern style crab cakes, and the crab and shrimp bisque. Good thing they offer combo platters so you don’t have to make hard choices. This menu is loaded with your favorite crab delights. Take your pick of crab cakes, fried crab claws, or soft shell crabs—even their seafood gumbo has delicious lumps of crab meat for a mouthwatering experience. Every meal is as fresh as they come and infuses a taste of New Orleans flare. It’s hard to make a bad choice when dining here, but crab is an obvious favorite. Crab claws, stuffed crab, and crab cakes are served as single meals or in combo platters. They also offer a pint-sized portion of crab claws for the kiddos. This oyster house is a long-standing tradition on Alabama’s Gulf Coast and has since grown to serve other areas of the state. Now with eight locations throughout Alabama, there’s not much excuse not to pay them a visit. Alabama blue crab claws and crab cakes are two of the main stars here, and you’ll be tempted to try them both. Folks love coming here for many reasons, but the amazing crab cakes and dinner-with-a-view are reasons enough. The food here is fresh off the boats for the best in quality and flavor. Stop in for lunch or dinner—it might just become your new go-to.